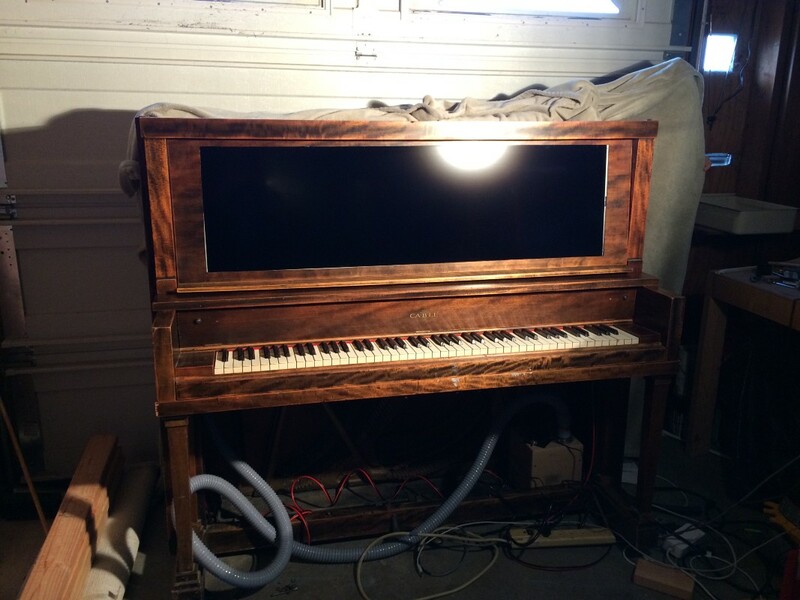 This retrofitted player piano is like Disney’s Haunted Mansion meets Daft Punk. 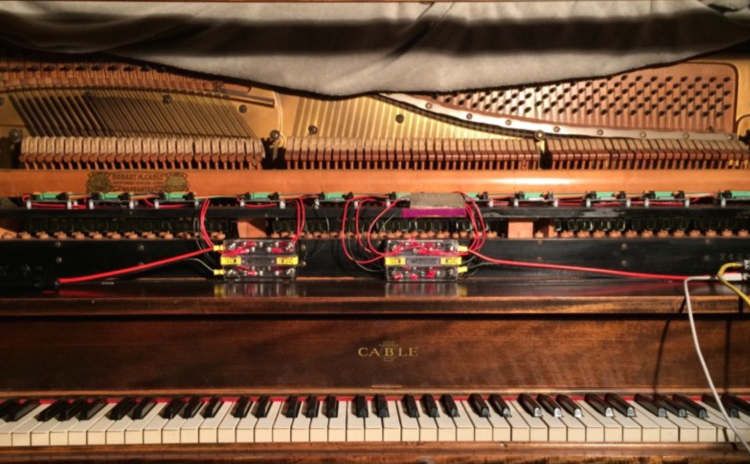 As seen back at Maker Faire Bay Area, Maker Ramon Yvarra has innovatively transformed an antiquated, 700-pound player piano from the 1920s into a modern-day, MIDI-powered instrument. Housed inside the retrofitted Hobart M. Cable digital player piano lies a series of two registers and 11 custom circuit boards to drive the system, all chained together to an Arduino Mega (ATmega2560) and an Ethernet shield. The unit can be connected to his Mac and controlled over Wi-Fi via rtpMIDI. For those who may not know, old-school player pianos work using vacuum pressure and a series of bellows connected to hammers tasked with hitting each key. A paper roll passes over a tracker bar attached to those bellows, and with each hole in the roll, allows the vacuum pressure through to close the bellow and the hammer to strike the key. Meanwhile, a solenoid valve handles the airflow. Next, the Maker needed to determine how to proceed with driving the player mechanism digitally. To do so, each of the instrument’s control boards have a single shift register. “I knew that I could turn on eight items at a time and therefore only need 11 registers to control 88 keys. I started out by reading the specifications for the 74HC595 shift register, but the voltage and current supported by that chip was insufficient to control 12V solenoids, so I found a higher current chip that looked like it would fit the bill perfectly,” he notes. While it may’ve strayed just a bit from its near 100-year-old aesthetics, the Maker inserted a massive 49.5″ x 15.25″ LCD panel into its existing wooden frame for enhanced visual effects. “I think people forgot player pianos existed and making it digital makes it all more enjoyable,” Yvarra tells MAKE: Magazine. Those wishing to learn more can head over to the Maker’s elaborate write-up, which takes you through the entire build process. Otherwise, watch it in action below! 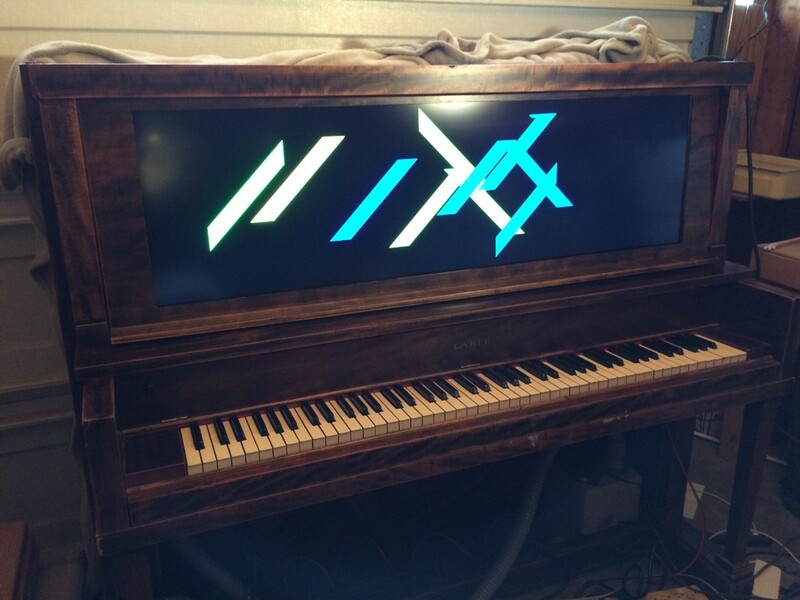 This entry was posted in Arduino, Maker Movement and tagged Arduino, Arduino MEGA, ATmega2560, Digital Player Piano, Maker Faire, Makers, MIDI, MIDI Piano, VirtualRoll on June 1, 2015 by The Atmel Team.